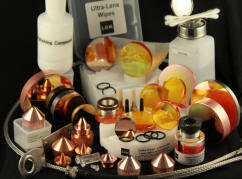 Infrared and CO2 Laser Optics, Mirrors, Cutting Lens, Focus Lens, Nozzles and Consumables. Plasma, MIG and TIG consumables. 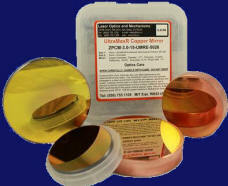 Click here for technical information on Ultra-Lenses and UltraMaxR mirrors. Contact LOM for low prices. Most lenses in stock for immediate shipment to most countries. Cut better, faster, longer and reduce your cost of laser operations with ultra-lenses. Ultra-Lens Technology - Extreme Performance - Are you ready? - Simply the best cutting lens for high power CO2 laser cutting when standard lenses fail to perform. Longer-life, better cut quality. The benefits are significant. Ultra-Lenses available for Amada, AdigeSala, Bystronic, Cincinnati, FinnPower, Koike, LaserDyne, LVD, Mazak, Mitsubishi, NTC, Prima, Strippit, Tanaka, Trumpf and more... Call LOM USA (858)755-1105 for a technical datasheet. Lowest prices on high performance and reliable gold mirrors for Amada, AdigeSala, Bystronic, Cincinnati, FinnPower, Koike, LaserDyne, LVD, Mazak, Mitsubishi, NTC, Prima, Strippit, Tanaka, Trumpf and more. Laser Optics and Mechanisms was formed in 1998 to provide advanced solutions for materials processing to industry. We manufacture high performance consumables for Industrial laser machines at competitive prices together with a fast and friendly service. Our high quality products are trusted by many laser manufacturers and end-users worldwide. With over twenty five years of experience with high power lasers and optics, we understand materials processing applications. Call on our team to support your needs. A range of products for industrial lasers cutting and welding systems. 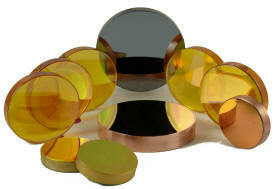 Precision optics and optical assemblies for high power lasers, low power lasers and scientific applications. 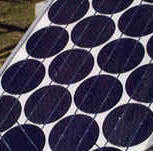 Materials used for optics manufacturing include Zinc Selenide, Germanium, Gallium Arsenide, Silicon, Copper, Silicon Dioxide, Sapphire and others. Provide customers with innovative product solutions and services with superior quality, performance and value. Express international shipment to most countries via UPS, FedEx, DHL or a freight carrier of your choice. LOM is in no way affiliated with any of the OEMs listed in this website. Any reference to OEM part number, registered or trade marked logos are for your convenience and reference only.